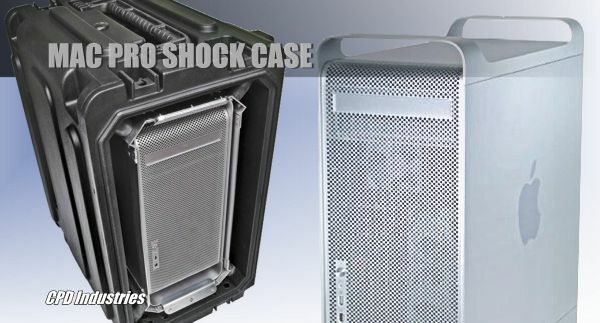 The new rotationally molded Rolling Shockmount Mac Pro Tower Case accommodates the Mac Pro Tower and provides convenient portability along with continuous shock absorbing protection. The case is specifically engineered with TSA trigger latches and low profile injection-molded pull handles. Steel rack rails located in the front and back of case allow for the Mac Pro Tower to be vertically mounted in the case. Eight elastomeric corner shocks make the case vibration-proof and allow for easy transportation of even the heaviest loads. The rotationally molded design provides added protection in the lids and sides and allows for secure stacking. The case is 20 inches in depth and each lid is 2 ¼ inches deep. Doors are operational even when racks are stacked. Sliding retractable handle, ambient pressure relief valve, oversized snap-down handles on each side, roller blade wheels, and gasket protected front and rear doors are all standard. LId Depth 2 1/4 "
Rack Depth Rail to Rail 20"
Rack Depth Front Rail to Back Lid 22.5"
Case Weight Lbs. 44.25 lbs.